Harley-Davidson plans to shift some motorcycle production away from the US to avoid the "substantial" burden of European Union tariffs. Last week, the EU imposed retaliatory tariffs on US goods, including bourbon, orange juice and motorcycles. The measures are a response to new US duties on steel and aluminium imports. Wisconsin-based Harley-Davidson said the increased cost from the tariffs threaten its international sales, which it has been trying to expand. The company has assembly plants in Australia, Brazil, India and Thailand as well as in the US. It said it would raise investment in its international plants, though it did not say which ones. "To address the substantial cost of this tariff burden long-term, Harley-Davidson will be implementing a plan to shift production of motorcycles for EU destinations from the US to its international facilities to avoid the tariff burden," the company said. Harley-Davidson said it expected the ramp-up in production to take nine to 18 months. Who is losing out from Trump's tariffs? The move is one of the most visible consequences of the trade disputes triggered by US President Donald Trump's decision to levy tariffs on steel and aluminium imports. Mr Trump says the duties are necessary to protect the US steel and aluminium industries, which are vital to national security. They have drawn retaliation from the EU, Canada, Mexico, India and others while driving up the cost of metals for manufacturers in the US. US companies that range from boat-builders to nail manufacturers have warned about the consequences of escalating trade tensions. However, the tariffs have also helped to spur investment in US steel plants. For example, British-owned GFG Alliance, has said it plans to invest $5bn over several years to reopen a shuttered steel plant in South Carolina. The firm says the move will put about 125 people back to work "immediately". 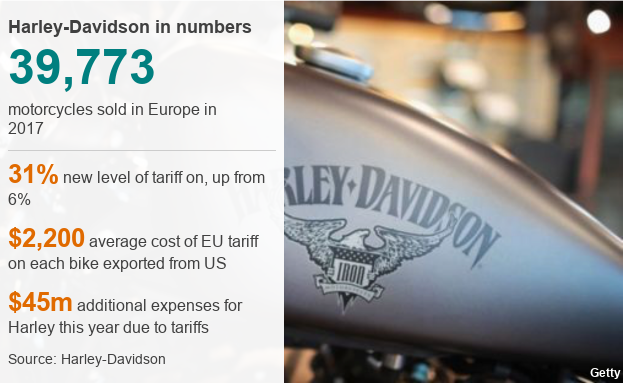 Harley-Davidson said the EU's tariffs would add, on average, $2,200 (£1,660) to each bike exported to Europe from the US as the import tax increases from 6% to 31%. Harley, which sold nearly 40,000 motorcycles in Europe last year, said it planned to absorb those costs which are expected to add between $30m and $45m to its expenses this year. The company said that passing the costs onto customers "would have an immediate and lasting detrimental impact to its business in the region". It said the tariffs make shifting production "the only sustainable option to make its motorcycles accessible to customers in the EU and maintain a viable business in Europe". Harley-Davidson, which has been focused on expanding its overseas sales, said it remained committed to US manufacturing. 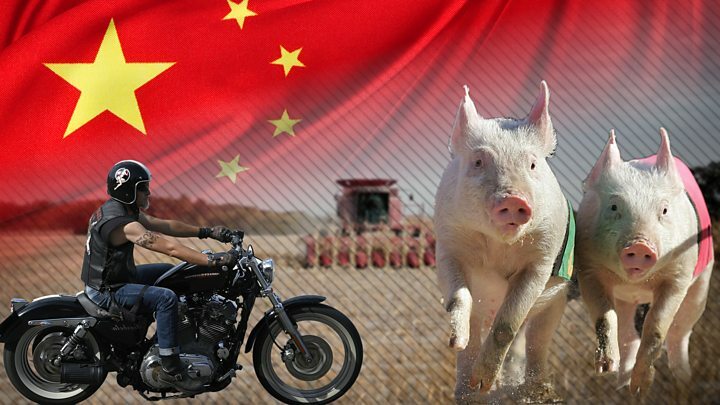 How hogs and Harleys became weapons in a looming trade war. The company employed about 2,100 people at manufacturing plants in the US at the end of last year. It had already announced plans to close a plant in Kansas City, Missouri - a decision which workers claimed was due to the opening of a new facility in Thailand. Harley-Davidson has disputed those allegations, arguing the move was about boosting overseas sales. In early 2017, President Donald Trump met with executives from Harley-Davidson who he thanked for "building things in America". But just over a year later, Harley serves as a sobering example of what happens when Trump's America First trade policy collides with the rest of the world. While Harley-Davidson had been struggling financially well before the EU's retaliatory tariffs went into effect, the import duties of 25% certainly didn't help matters.